Get 1 FREE! The more you buy, the more you earn! Start earning free product today. Go to your local myAGWAY. Ask them about becoming an myAGWAY Salt Club member. Every time you come into the store and purchase the Agway Water Softener products listed below, the store will scan your Rewards Card. When you have purchased 8 bags of the same product, you will get one bag of the same product for free. Agway Iron Fighter Pellets - 40 lbs. Agway Water Softener Salt Pellets - 40 lbs. 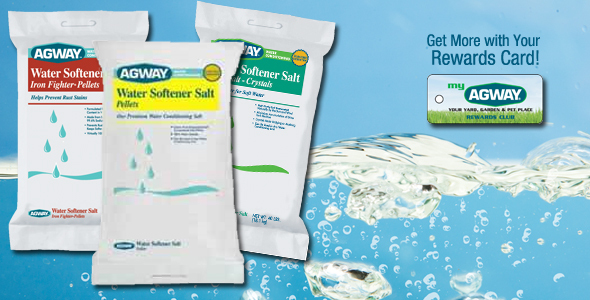 Agway Water Softener Salt Crystals - 40 lbs.